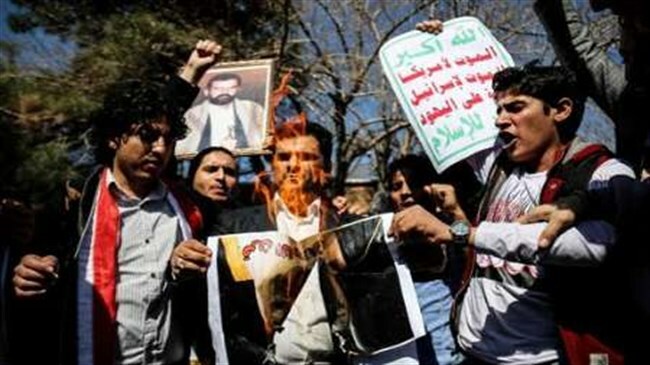 Yemeni students, residing in Tehran, staged a sit-in outside the UN office in Tehran on Monday to protest the 'deadly and shameful' silence of the international organizations against Saudi brutal invasion on their country. The demonstrators strongly condemned Saudi 'shameful' crimes, using banned arms to massacre women, children and the elderly and ruin their homes and infrastructural facilities, IRNA reported. They called for immediate cessation of invasion and siege of Yemen, asking all the world freedom lovers to abide by their responsibility towards Yemeni nation to confront aggression, massacre and siege of Yemen.